One of the more disturbing numbers which came out of the Arizona Coyotes disastrous season last year was their appalling plus/minus ratio. By season’s end, not one player was in the plus area and attempts were made over the off-season to address a porous defense. With the trade acquisition of defenseman Nicklas Grosmann from the Flyers and bringing back Zbynek Michalek, the hope is that these veterans can address the issue of a leaky defense. If Arizona decision-makers want to improve play at the blue line, Connor Murphy appears ready to accept a new role and difficult challenge. While the 22-year-old out of Dublin, Ohio, Murphy, son of former NHL defenseman Gord Murphy, recorded the highest minus numbers among defenseman, he discounts that figure as having any meaningful value. Plus, the plus-minus ratio, he believes, is an overrated form of evaluation. If the Coyotes are trying to lift themselves from the debacle of a year ago, Murphy is equally challenged about setting a new course. Over the recent summer, he undertook a massive land and ice training program in which he brought his playing weight up to 210 pounds and worked on power skating. The result, he says, is an increase of speed on the ice, greater mobility and greater strength. While coach Dave Tippett continues to figure out final lines and defensive pairings here in training camp, Murphy will likely end up with Grossman as his blue line partner. With a strong right-handed shot, Murphy can also play the right point on the power play, although it’s likely Tippett would use Michael Stone initially. 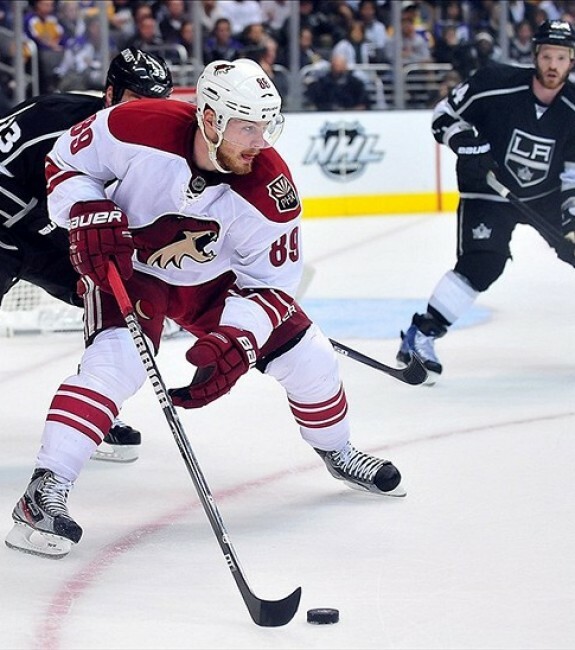 As well, winger Mikkel Boedker has been practicing at the point on the power play, but Murphy remains a viable option. For now, Murphy says he want to settle in as a reliable defenseman, one who protects the crease and develops into a steady worker in front of Mike Smith, the Arizona net-minder. That drive should serve Murphy well and propel him into a dependable and steadfast NHL defenseman. During the 2013-14 season, Murphy seemed to be on a constant shuttle between the AHL Portland Pirates and the Coyotes. 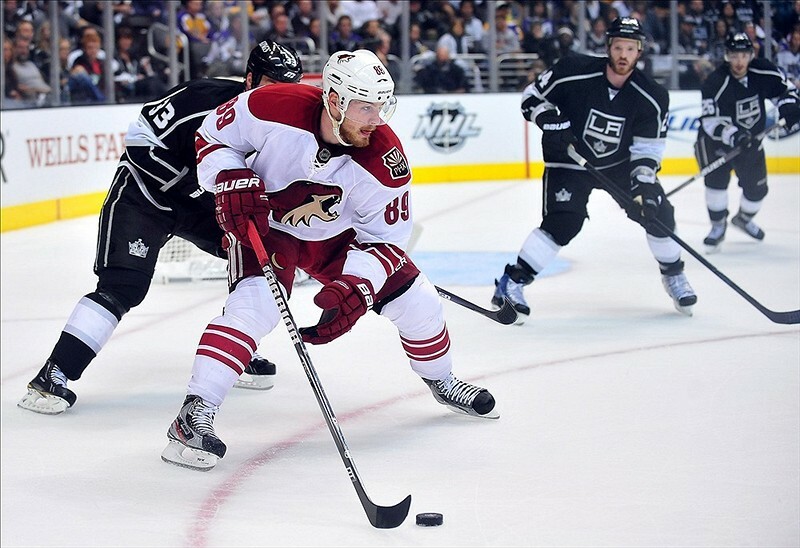 After participating in 30 games for the Coyotes that season, Murphy gained the graces of the decision-makers and elevated into full-time status last season. Following a campaign in which the 6-4, 210 pounder scored four goals and assisted on seven others, his transition was deemed complete. Now, Murphy and Grossmann will team together and bring a needed balance. Grossmann comes with size and force, at 6-4 and 230 pounds, and a familiarity with Tippett, for whom he played during parts of three seasons in Dallas. Murphy brings youth, speed and energy. The same can be said for a pairing of Michalek and Klas Dalhbeck while the pair of Oliver Ekman-Larsson and Stone should give Tippett three solid pairs. For his part, Murphy, still in his early 20s, with a defined off-season program established and strength renewed, should merge as an important segment of the Coyotes’ defensive core. That’s not to mention his growing importance as a vocal leader on the ice and a steady, driving force in the clubhouse.